FOSTER UPDATE: Vana was a scared pooch when she first came to AGR. Now in foster, Vana is gradually learning that the outside world can be exciting and fun. 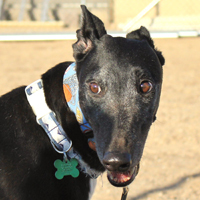 She is living with two other greys and enjoys being one of the pack: she’s not an alpha dog. Vana remains shy but quiet, gentle reassurance will help her overcome her shyness. She is house trained without a doggie door. There have been no accidents or incidents of destruction in the house. Vana is not to be crated. When the vacuum is dragged out, Vana and her greyhound roommates disappear. Loud noises still scare her and she is not thrilled with ceiling fans, but has adjusted to them. Vana is healthy and eats well; no foods seem to upset her tummy. While still timid, Vana is not beyond countersurfing: she recently swiped a cooked chicken breast off the counter! As soon as she’s a little more confident with the world around her, Vana will make the perfect fur companion for the right person/people.